Never Mind The Callaway Porsche 944: 1982 Callaway Scirocco! Callaway Cars held their first annual open house on the second weekend of October at the company’s headquarters located in bucolic Old Lyme Connecticut. Saturday was a spectacular, New England autumn day, bright, sunny, and warmer than normal, just right to showcase some of the rarest automotive creations that were ever made. This was also a chance to take in the essence of an organization, which grew from a one man business that was conducted in a garage in his home, to a well respected engineering and production company with three locations worldwide. I knew I would feel a little out of place, milling about between the owners of these rare cars and the cars themselves, until I came across one of the earliest Callaway Scirocco. This 1982 Volkswagen Scirocco was not a show car by any means. The Black finish doesn’t shine as brightly as it did when it was new, the front and rear bumpers have taken on a silver gray hue from years of sitting outside, and the interior took on an aged, and weathered look, with the many wrinkles and cracks that are easily covered up on an aging Hollywood starlets face, but are proudly worn as a badge of honor on this car. You see, this car still has the Callaway Turbo window decal still in place, along with the set of Centro Wheels that were standard equipment with the package, and while it may not be a concourse winner any time in the future, it is a historical tribute to the Callaway name. And there it sat, among all those beautiful Stock, and Callaway modified Corvettes, commanding attention, almost as if the car was saying “Hell yea, I belong here too”. And it did. The car is owned by John Kulp from Malvern Pennsylvania. While the car probably doesn’t produce anywhere near the 117 HP it once produced when it left the Callaway location all those years ago, it will get out of its own way. The car traversed to Old Lyme from PA, and according to John, it was comfortable, quick, and economical, just the way he imagined it would be all those many years ago when the car of his dreams was introduced in the early 80’s. John always wanted a Callaway equipped Scirocco, but could never afford one. 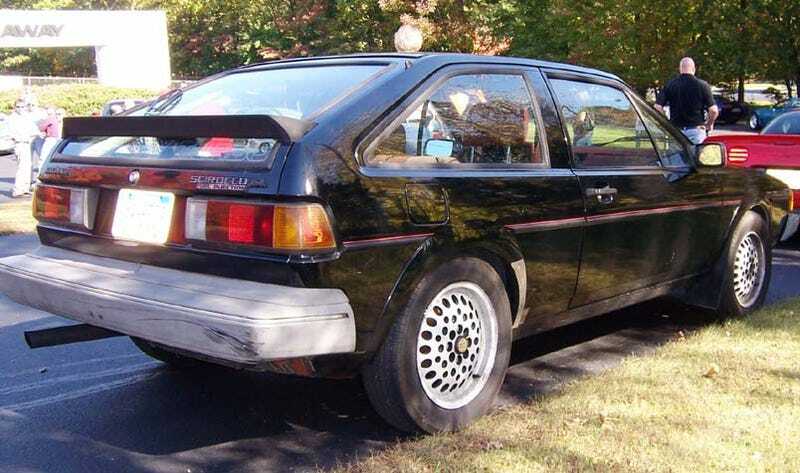 That all changed when this car popped up on an Ebay Auction from a Connecticut Saab dealer, and soon enough, he was the owner of a well worn, but still hugely relevant VW Scirocco by Callaway. To coin a phrase from Hemmings, this is a “Drivable Dream”. There is over 80,000 miles showing on the odometer, and it needs a great deal of work to become show worthy. The biggest problem John discovered is how pervasive the rust problem is. While the car s relatively rust free from the “B” pillar forward, almost everything back has the dreaded tin worm. One problem can be traced to the aftermarket electric sunroof installed by the original dealer, in which the drain holes never seemed to work correctly, collecting water within the roof panel, and support structure. The other problem was neglect, as if the car was parked in the mud, because the rear chassis and lower body is almost nonexistent. The one good thing about owning a unique vehicle based on a corresponding production one is that there are plenty of cheap, spare parts to replace components such as doors, fenders, and chassis parts, and this type of surgery is slated in the future for John’s car. I asked John how he felt being the only participant to bring an early Callaway Scirocco into an event dominated by so many factory and modified Corvettes, and he said it was what he expected, except that instead of feeling like an outcast, he was totally embraced into the Callaway Family. So, as I bid farewell to John Kulp, and took the last set of images of his newly found pride and joy, maybe I shouldn’t feel out of place in which there is such a gathering of historical and ground breaking cars. And from that point, I didn’t.